Dirofilariasis is an endemic disease in tropical and subtropical countries caused by about 40 different species of dirofilari. Dirofilariasis of the oral cavity is extremely rare and is usually seen as mucosal or submucosal nodules. We also present a case of dirofilariasis of the mandibular third molar region submucosally in a 26 year old male patient. 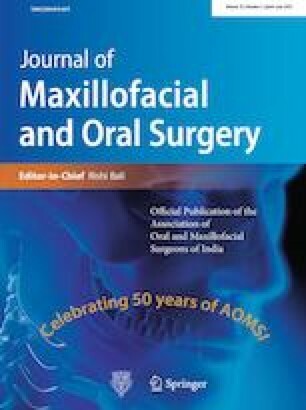 To identify, enlist and analyze the cases of dirofilariasis in maxillofacial region reported worldwide so as to understand the clinical presentation and encourage the consideration of helminthic infections as a possible differential diagnosis in maxillofacial swellings. Two authors KC and SK independently searched the electronic database of PUBMED, OVID, Google Scholar and manual search from other sources. A general search strategy was planned and anatomic areas of interest identified. The search was made within a bracket of 1 month by the independent authors KC and SK who assessed titles, abstracts and full texts of articles based on the decided keywords. The final selection of articles was screened for the cases that were reported in the maxillofacial region including the age, gender, site of occurrence and region of the world reported in. A geographic distribution of the reported cases was tabulated. A total number of 265, 97, 1327, 3 articles were identified by PubMed, Ovid, GoogleScholar and manual search respectively. The final articles were manually searched for duplicates and filtered according to the inclusion/exclusion criteria which led to a final list of 58 unique articles that were included in the study. In total 99 cases were identified. Although intraoral dirofilarial infections are extremely uncommon, it should be considered in the differential diagnosis of an intraoral or facial swelling that does not completely respond to routine therapy especially in patients from endemic areas.